N'aie Pas Peur by Mayumi Oda. N'aie pas peur translates has have not fear, the piece is also known as The Black Madonna. A mother and child stand together under a golden mandorla. 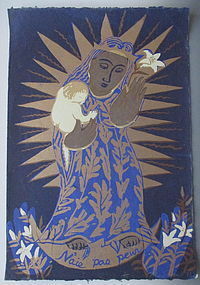 The mother is Mary, mother of Jesus, she holds a white lily. This is print 7/50. 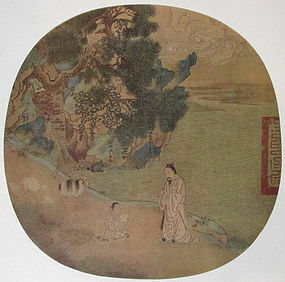 The Heart Sutra with Taro by Mayumi Oda. The paper is green with a sutra printed. A sutra is a formula or rule for life. A tree with large leaves and a frog are outlined by a silver spray. It measures 38.5" wide 12.25" tall. 28/50. Green print of Earthship by Mayumi Oda. Print 16/100. 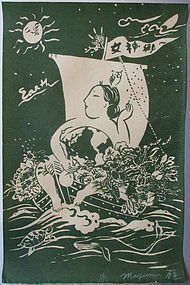 A woman sails in a ship with an owl atop her head and a boat full of vegetables. Below the ship, in the ocean a sea turtle and a whale swim by. The sun smiles down upon the woman in the ship. It measures 11.75" wide 19" tall. 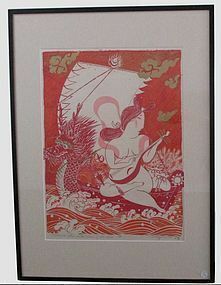 Contemporary print by Mayumi Oda. 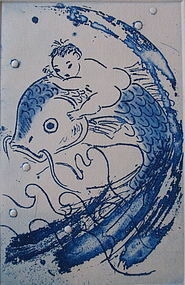 A baby rides a catfish that leaps out of the ocean. The waves are outlined below the fish. The print is signed at the bottom in pencil. 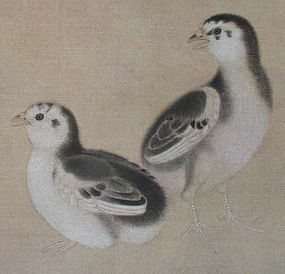 Chinese print, made in the 1950s by the National Museum in Taipei, of 16th or 17th century original fan. This print is part of a collection of four volumes each with 10 prints or paintings and fans. 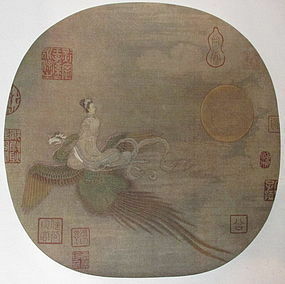 The woman is wearing elegant garments that billow in the wind as she stands atop a phoenix whose wings are flapping as they ascend through the clouds together, the sun glowing behind them. The image measures 8" wide. The book measures 15.25" tall 13" wide .5" deep. 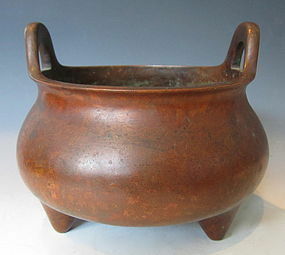 Chinese huang huali box from the mid 20th century. 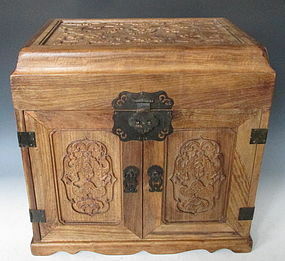 The box is beautifully decorated with dragons on the front doors and the top. The top of the box and doors open to reveal an open compartment and four drawers. The box has handles on either side. The piece is fitted with metal hardware. It measures 14" wide 9.5" deep 13.5" tall.